So, another day of stalemate at Stormont... what's new, you might well ask? The deadline has passed to form a new executive and there's nothing in place, so it looks like it's back to the talks table for the political parties. We'll hopefully find out what Northern Ireland Secretary James Brokenshire's plan is tomorrow when he gives a statement in the House of Commons. But until then, that's all from us - goodnight. Sinn Féin's Gerry Kelly denies that the party are not interested in getting devolution back, saying "no-one has worked harder than ourselves to try and get these institutions to work". "But they have to work on the basis of equality and on the basis of respect and that has not been there," he says. Ulster Unionist Tom Elliott has described the talks process as shambolic and said the DUP and Sinn Féin are incapable of doing a deal on their own. "The secretary of state was weak in letting the talks drift along and appears to have seen his role as a facilitator rather than as a convenor. He needs to take a grip of the situation," he added. Former taoiseach Bertie Ahern says a deadline to reach agreement should be set at Easter, but he's optimistic that minor issues can be ironed out sooner than that. "Most of them are not complicated issues; most of them are issues that were thrashed out in the run up to last year's election," he says. "I really think that if they put their heads to this, and their commitment and trust into each other, they can wrap this up in two weeks." Political "impotence" at Stormont can't continue and the parties must return to the talks table, SDLP leader Colum Eastwood says. "We are facing an immediate budgetary crisis; we are days away from the triggering of Article 50," he adds. "What's needed now is a new, structured dialogue to take the place of the shapeless process that has concluded - a resolution is possible." The DUP's Nigel Dodds says Sinn Féin's approach to the talks raises questions about whether their focus is really on restoring devolution, or do they want to "sit out" difficult decisions that will have to be made in government. "The jury is out on Sinn Féin's position at the moment and I think they will have to be tested. We are certainly up for devolution," he said. Parties need to "get serious" about striking a deal in the extended negotiating window, Alliance Party leader Naomi Long says. "It is unthinkable a project made up of 25 years of hope, time and effort from many quarters could be thrown away so lightly," she adds. "If people are sincere about reaching a deal, there is no reason things cannot get serious, immediately." Ultimately, the Stormont crisis will be resolved by the parties themselves getting around the table, supported by the government. People will say: 'Is that not what we just had?' and 'What will be different this time?' James Brokenshire did not give us any of those details. Mr Brokenshire says there's been progress on a number of issues, including setting a budget, a programme for government, and legacy issues. He added: "There remain significant gaps between parties over issues surrounding culture and identity." The secretary of state says there is an "overwhelming desire" for "strong and stable devolved government" and "no appetite for any alternative". The Irish Foreign Affairss Minister Charlie Flanagan has expressed his "deep regret" that a deal has not been possible. "It is particularly concerning that a vacuum in devolved government in Northern Ireland should now be occurring just as the island of Ireland faces up to the many serious challenges represented by the UK exit from the EU," he said. "The Irish Government will continue to advocate very strongly for Northern Ireland's interests to be protected. However, there is no substitute for an executive speaking with one voice on these critical issues." The secretary of state says he does not believe there is any appetite "for any immediate snap election". "We now have a small window of opportunity" to find agreement,he says. We're waiting for a statement from Secretary of State James Brokenshire - he's set to appear any moment. The 4pm deadline to appoint first and deputy first ministers and form an executive has passed without agreement. Secretary of State James Brokenshire is expected to announce shortly whether he will allow negotiations to continue, call another election or reimpose direct rule from London. What next for the budget? With no deal at Stormont, no budget will be passed for the new financial year - so what now? Well, public services won't grind to a halt. Instead, the most senior civil servant at the Department of Finance, David Sterling, will use emergency powers to keep some money flowing. Read more: No Stormont budget - what happen next? 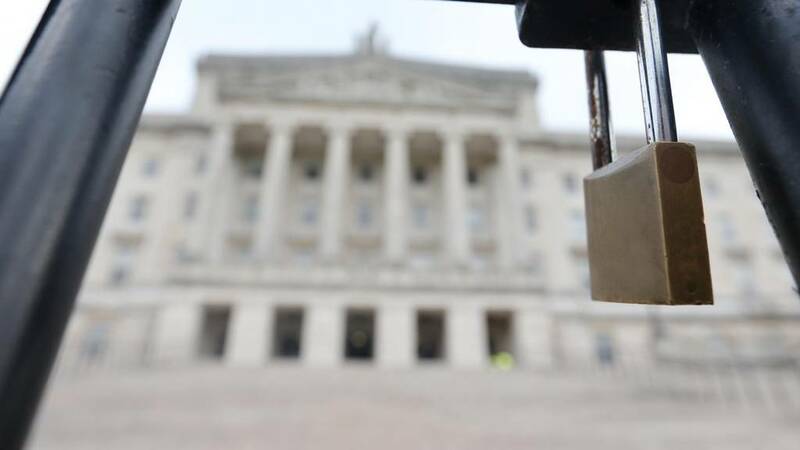 The voluntary and community sectors are being severely impacted by a lack of an agreed Stormont budget and uncertainty over funding, the Northern Ireland Council for Voluntary Action (NICVA) says. Failure to agree a political deal means it will be up to the civil service to set a budget. NICVA chief executive Seamus McAleavey (pictured) says: "NICVA fears that, even before further cuts are confirmed, the current uncertainty on funding for next year will be extremely damaging to organisations seeking to provide continuity of services and retain worried staff." Ian Paisley Junior, Democratic Unionist Party MP in Northern Ireland, has said "there is a deliberate attitude to undermine" Secretary of State for Northern Ireland James Brokenshire by Sinn Féin. Mr Paisley told Martha Kearney on BBC Radio Four the DUP was not opposed to compromise on the Irish language act but that they are "issues that the legislature should be dealing with, not negotiation". Judging by today, it looks like Robin Swann will have plenty to deal with after he becomes the UUP leader.